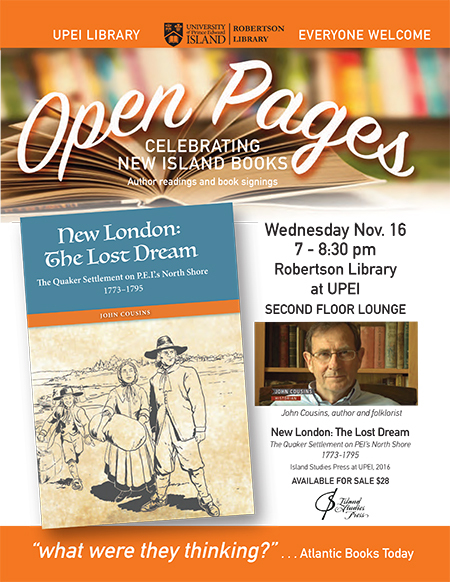 November’s “Open Pages” happens at UPEI’s Robertson Library on Wednesday evening November 16, at 7 pm and highlights the book New London: The Lost Dream. Open Pages features local authors speaking about their books: what inspired them, what they learned, what they shared. The public is warmly invited to this evening, which takes place in the common area on the second floor of UPEI. Light refreshments will be served, and books will be for sale, and signing by the author. New London: The Lost Dream is the true story of the brave Quakers from London, England who settled along PEI’s north shore in 1773. If you’ve ever wondered what it was like for our first settlers on the Island, this book is an excellent recreation of how they arrived, survived, and occasionally thrived in the “new world” that was PEI in the mid-1700s.